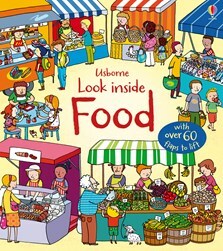 Little children can find out all about where the food they eat comes from in this colourful lift-the-flap book. Lift the flaps to look inside kitchen cupboards and a refrigerator, watch fields being sown with rice and wheat and see cows being milked on a farm. With special pages on farm animals, food from the sea and why we need to eat a balanced diet. A lovely introduction to food from farm to fork for young children.